Except when it is this pretty. 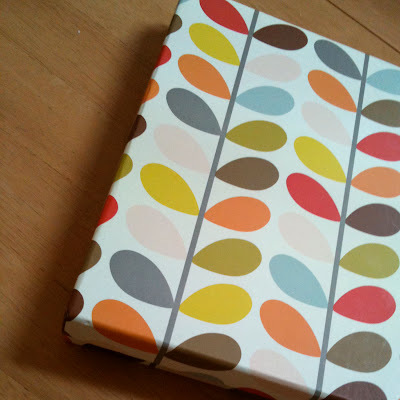 I bought a couple of Orla Kiely pillowcases (on sale! I would never pay $80 for pillowcases, but $10, why, sure, thank you, Mr Myer!) and while I love them, it was actually the packaging that first caught my eye. I need to come up with some way of reusing this sweet little box. I had planned on doing something with it over the weekend, as I had planned to do many other things (go out for yum cha, clean out the bathroom cabinet, have a sleep on the grass) but, alas, none of those were to be. I did get to go out for a few hours on Saturday night and catch my brother-in-law's gig in Newtown though. Super fun! And eating a meal out after 8:30pm while having a glass of wine was way novel. Aside from that, I watched the Royal Wedding, we started the little man on rice cereal yesterday, I listed some stuff for sale on Ebay (more to come this week. I'm trying to keep up on my "Get rid of five things a week" challenge but it's, well, challenging) and I've been brainstorming craft projects and homemade gift ideas for Mother's Day and my nieces and nephews birthdays. I hope you all had wonderful weekends?